This offer is only available to newly registered customers who don't have an existing Betdaq account. 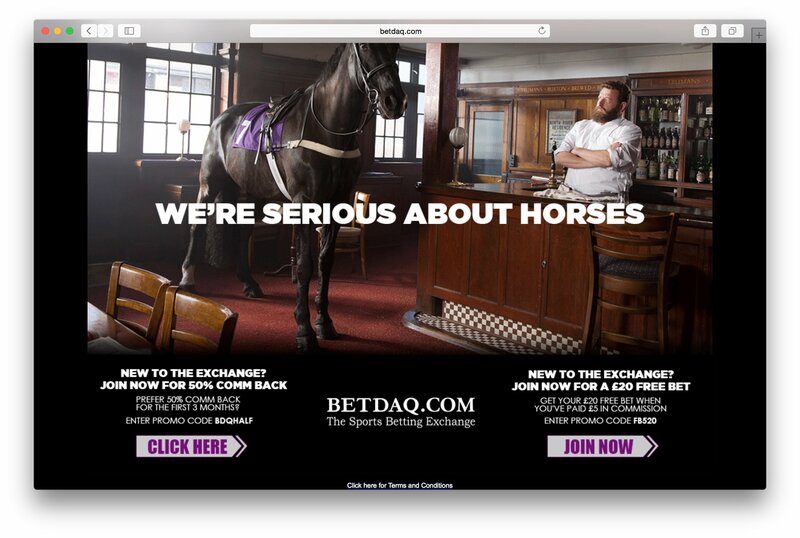 In order to take advantage of this offer, you just need to sign up with Betdaq using the code DAQBACK. Once the registration process is complete, the users will receive a rebate of any commission paid in the first 30 days at the end of this period. This rebate will be to a maximum of £1,000 Open your new account at Betdaq today using the promo code FB2515 and get your £20 free bet when you pay just £5 in commission. 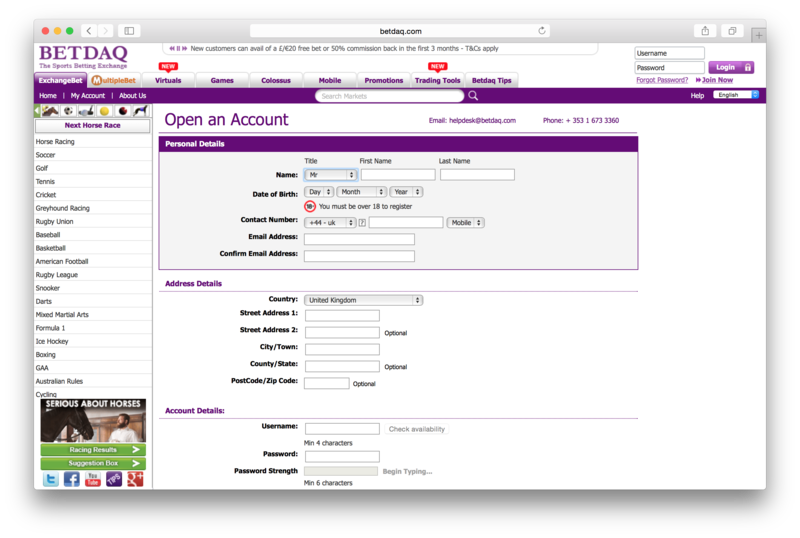 You must be aged over 18 to open a Betdaq betting account. Free bet promotion open to UK & Ireland residents only. T&C's apply. You must be aged over 18 to open a Betdaq betting account. Looks like Betdaq isn't promoting any special offers, right now. Check back soon! Joined up to get an overview on the markets compared to Betfair, whilst a good service it lacks some of option that Betfair has and some markets don't have liquidity required which can be annoying. Betfair's little sister. The one who is more generous but doesn't have many friends. Far fewer friends infact. Whilst Betdaq do have a wide range of in-depth markets on events (although not a great deal of sports to choose from), and generally better odds than the sportsbooks, Betdaq has far, far fewer players than Betfair meaning there isn't much liquidity, and therefore that's a problem when trying to get a bet matched for the lesser popular events. Therefore this isn't a great place for the high-stakes punters; often there is too little money available to back and lay, and this can be a particular problem in-play. Consider this is the backup exchange to Betfair for both the timebeing and problem the long-term future as they don't appear to be making much headway. 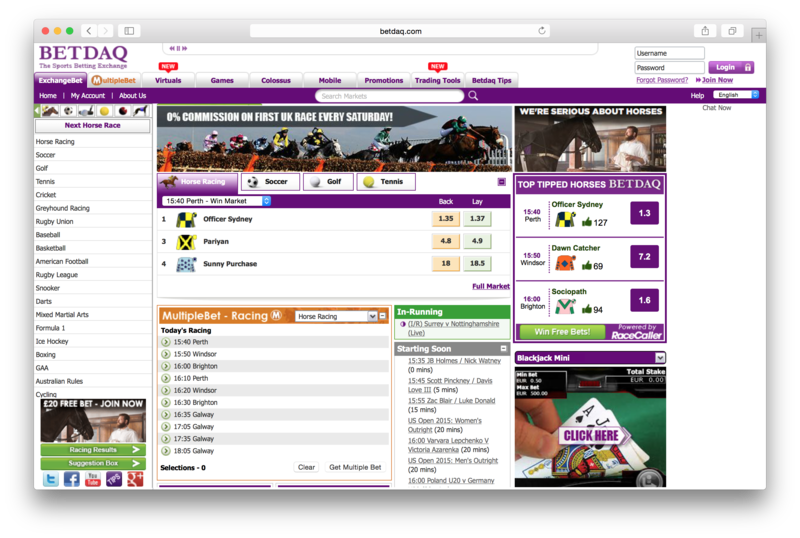 Of course there are still good reasons to pick Betdaq over a sportsbook, not least because their odds are better and the tax on your winnings is less than Betfair.